MeryJono: ItBoys from the streets! Hablemos de estos "hombres" que ya marcan tendencia, los Itboys, hacen furor cada vez salen a la calle! 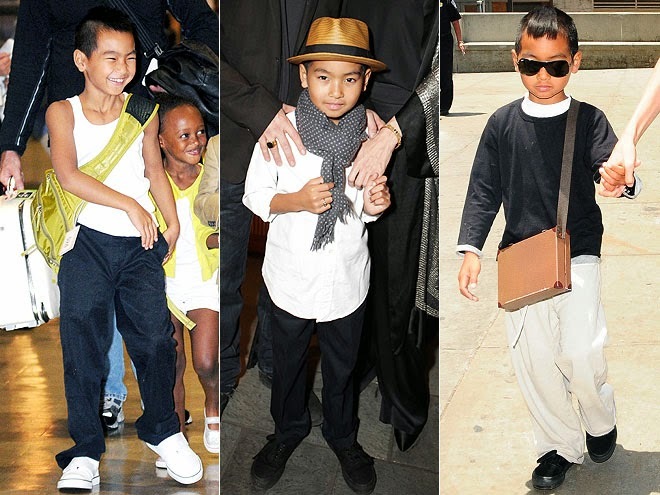 Let´s talk about those Little Men, that are already trendsetters , this It Boys that every time they go out are a boom! Este es Romeo Beckham, hijo del jugador de fútbol y de la Spicegirl y diseñadora, Victoria. Bueno, digamos que con estos dos padres no falta decir como iba a vestirse el hijo! 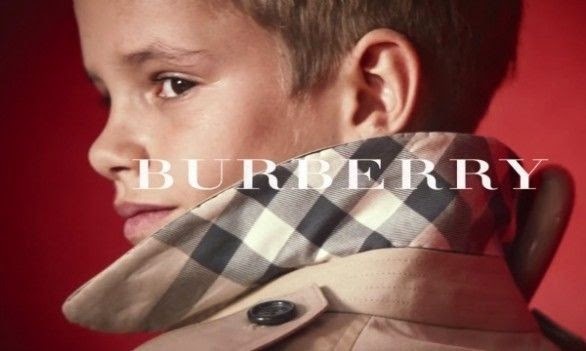 El año pasado Romeo fue parte de la campaña de Burberry, mucho futuro le queda a este chico! He is Romeo Beckham, son of football player and Spicegirl and designer, Victoria. Well, let´s say with these parents is not much to say of how their son would dress up ! Last year Romeo was part of the Burberry campaign,what else is left for this guy! Este el el hijo de Gwen Stefani, toda la onda! Se llama Kingston. Usa el pelo teñido de amarillo casi blanco y se viste como un Rockstar. 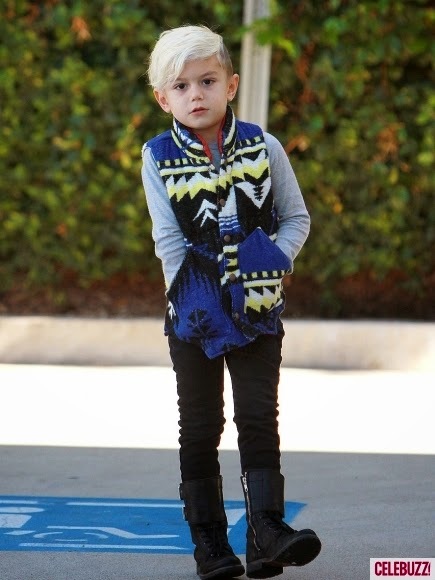 This is Gwen Stefani's son, so fashionista! His name is Kingston. his hair dyed in a blonde colour almost white and he dress as a Rockstar. 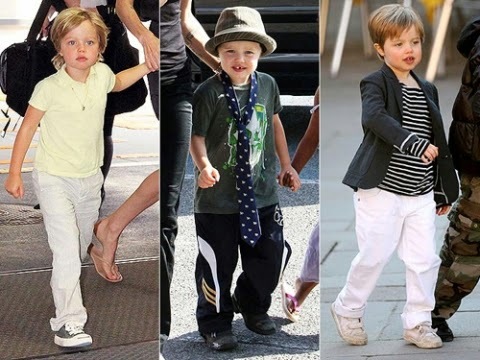 Maddox, el hijo de Angelina Jolie y Brad Pitt. Marcó tendencia desde muy chiquito, por la cresta que le hizo Angie en su pelo. Lo vemos con sombrero, lentes y hasta con sus propios bolsos, super trendy. Maddox, the son of Angelina Jolie and Brad Pitt. .He was already a star at the beginning of his young age, since Angie made a crest on his hair. We will see him using hats, glasses and his own bags, super trendy. El hijo de Kourtny Kardashian y Scott Disick se llama Mason y se viste igual que el padre, como un Minimi de Scott. Muy canchero usa desde Burberry hasta Ralph Laurent. Y pongan mucha atención al calzado que usa! todo un hombresito. Kourtney Kardashian and Scott Disick son Mason dresses up just like his father, like a Minimum of Scott. Very fancy in Burberry or even Ralph Laurent. And take a look of his little shoes, Looks like a real big man! Esta es Shiloh, sí, es una mujer. La hija de Agelina Jolie, hermana de Maddox se viste de una forma algo particular. Un poco varonil digamos. La vamos a ver de pelo corto, con pantalones, shorts largos y hasta con corbatas! como dice su mama, yo la visto con lo que ella me pide, cada uno con los suyo! This is Shiloh, yes, it's a woman. Agelina Jolie's daughter, sister of Maddox wears a rather unique way. Slightly manly I think. We're going to see her with short hair, pants, long shorts and even ties! as his mother says, I dress her with what she wants to wear, well she certainly has her own style!